"By the end of 2012, one billion tourists will have traveled the globe in a single year," says the Secretary-General of the World Tourism Organization, Taleb Rifai. He further states, "Behind this impressive number lies an increasingly important engine of growth and job creation. Few realize that tourism is directly responsible for 5 percent of global GDP, that one out of every twelve people worldwide are employed in tourism or that tourism accounts for 30 percent of the world's trade in services." Furthermore, President Obama unveiled a U.S. tourism initiative to increase travel and tourism in the U.S. stating, "That’s how we’re going to rebuild an economy..." His announcement calls for a national strategy to make the United States the world’s top travel and tourism destination, as part of a comprehensive effort to spur job creation. If that's not a silver lining, I don't know what is. It's astoundingly good news, but it's up to you to claim your share! If you've been thinking the economy is killing your business you could be wrong. It's more likely your marketing. "Houston, we have a problem." When those words were first uttered by Apollo 13's crew it wasn't a humorous way to report any problem - it was a genuine report of a life threatening fault. Panicking or throwing in the towel weren't options. It was a call to action and a request for assistance. If you're struggling in this economy you may feel like an astronaut afloat without much hope. It's time to act utilizing every resource you've got including seeking help. In other words, treat it as if your life depends on it. For those of you already marketing on the Internet and still struggling, if your online presence mirrors your offline presence, you're not much better off than the social media and internet marketing skeptics, naysayers and laggers. 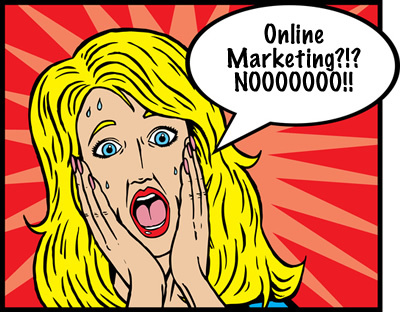 Traditional marketing moved on to the Internet is also ineffective. Today's consumers are smarter than that and they will quickly turn away. I'm not suggesting you should completely abandon everything you're currently doing just that you should start to move quickly in a better direction and you might need help refocusing. HubSpot says it well, "In traditional marketing (outbound marketing), companies focus on finding customers. They use techniques that are poorly targeted and that interrupt people. They use cold-calling, print advertising, T.V. advertising, junk mail, spam, and trade shows. “Audiences everywhere are tough. They don’t have time to be bored or brow beaten by orthodox, old-fashioned advertising. We’ve got to stop interrupting what people are interested in and be what people are interested in!” said the CCO of JWT the world's 4th largest Advertising Agency. 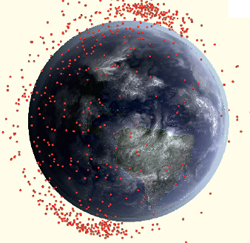 If you don't start listening to and adapting to the impact of internet marketing in your industry you may just end up in the stratosphere like space junk - barely noticeable. Let's have a look at internet marketing in context. Scotty Monty head of social marketing for Ford Motor Co. said, "Social marketing is the convergence of marketing, advertising and PR on the Web." True, but it's more than that. Simply put Internet marketing is networking. Unlike marketing, advertising and PR aimed at consumers, Internet marketing should be about interaction with your potential customers. When you're out networking you're putting your best foot forward, seeking out individuals or groups that matter to your business, not the masses in general, and you pitch them based on what they represent to your business; a potential customer, a lead to customers and sometimes a potential partnership. Equally important, today's customers want interaction; they want a voice and they want responses, so you need to be listening and responding well. According to HubSpot quoting an eMarketer article, these days "the expectation that a company will respond increases by age cohort from 38% of 18-24 year-olds all the way up to 65% of those in the 55+ age category. And it clearly matters in terms of satisfaction." Either percentage is a powerful message that consumers want to be heard. Internet marketing is networking amplified. The number of people you can potentially reach on the through it is staggering. Don't let your share go to some other hotel, restaurant or attraction. If it seems overwhelming turn to the management pro's like HubSpot. And if you need inspiration look to the shining examples like Virgin America. There's an endless amount of help out there free and subscribed (many subscriptions come with free trials), but you have to make the first move. The airline Virgin America is a great example of a company that's doing their due diligence in social media. VA utilizes every popular form of SM from Facebook to Groupon and they're very proactive; they monitor and respond quickly. Like Virgin America be ever vigilant on monitoring especially when it comes to problems or complaints. Believe it - an appropriate response to negative remarks can result in a very positive reaction from consumers. Again, consumers want to know you're listening. Domino's Pizza is another great example of this. They're looking for suggestions and feedback through social media and outwardly admitting their flaws and mistakes - addressing them very publicly. If you are not completely convinced to get started today with your Internet marketing campaign, it's not likely you ever will be. If you are, here are some resources I recommend to help you get started, including our amazing marketing website travelvision.com - a showcase for lodging, restaurants and attractions. Travelvision is turning up the volume on marketing. The Internet is ever evolving and you need to keep up with new and innovative opportunities. If you truly want your full share of the silver lining you need to be on travelvision.com - we're travel marketing amplified! Flowtown - A blog about small business marketing strategies, tools and tactics. There are also helpful links in prior posts.